West Coast Lady (Vanessa annabella) butterflies are found in western North America and throughout the entire state of Arizona. 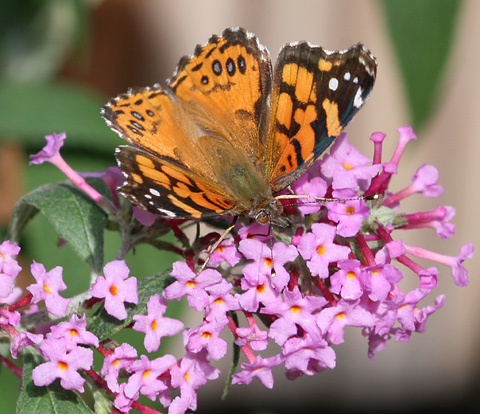 In early November, I spotted this autumn West Coast Lady on an Orange Eye Butterflybush (Buddleja davidii) in my Tucson, Arizona backyard. Lady butterflies (Vanessa spp.) are especially fond of this cultivated flower, and western gardens with Orange Eye Butterflybushes will almost certainly be visited by these lovely butterflies. I think that Vanessa annabella, the scientific name of West Coast Lady butterflies is one of the prettiest and easiest to remember scientific names of any species. And with their brilliant orange dorsal wing surfaces, West Coast Lady butterflies are equally as pretty as their very feminine scientific name. The bright orange dorsal wing surfaces of West Coast Lady butterflies are patterned with dark brown and white, and there are blue-centered eye-spots on the hindwings and an orange bar on the leading edge of the forewings. 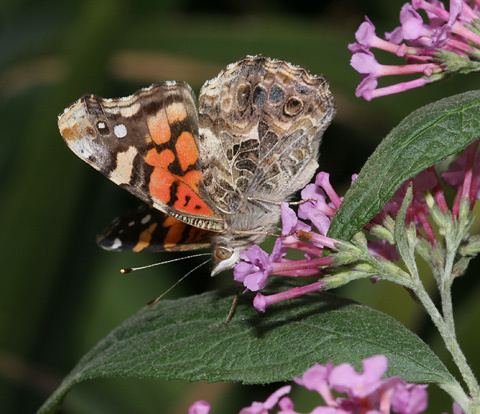 The similar Painted Lady (Vanessa cardui) butterfly has a white bar on the leading edge of the forewings. The American Lady (Vanessa virginiensis) butterfly is also very similar, but it has a small white spot on an orange area of the forewings. The ventral forewing surfaces of West Coast Lady butterflies are a bit paler and drabber than the dorsal forewing surfaces, but are otherwise generally similar. The ventral hindwings are mottled with a tree bark-like brown and cream, and there is a row of indistinct eye-spots near the edge of the ventral hindwings. Although adult West Coast Lady butterflies are very fond of Orange Eye Butterflybushes, their larvae are not. West Coast Lady caterpillars ignore plants in the Butterfly-bush Family (Buddlejaceae) and will instead feed on plants in the Mallow Family (Malvaceae) like Globemallows (Sphaeralcea spp. 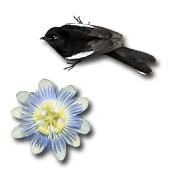 ), which are very common here in the Sonoran Desert.